The Sun is Shining and the grass is getting greener with each passing day. 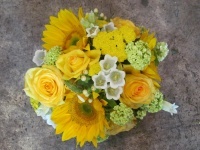 At the shop we have so many fresh and lovely flowers it is hard to select there are so many beautiful choices. Stop by our shop and take it all in. Here is one of our arrangements available for delivery today!